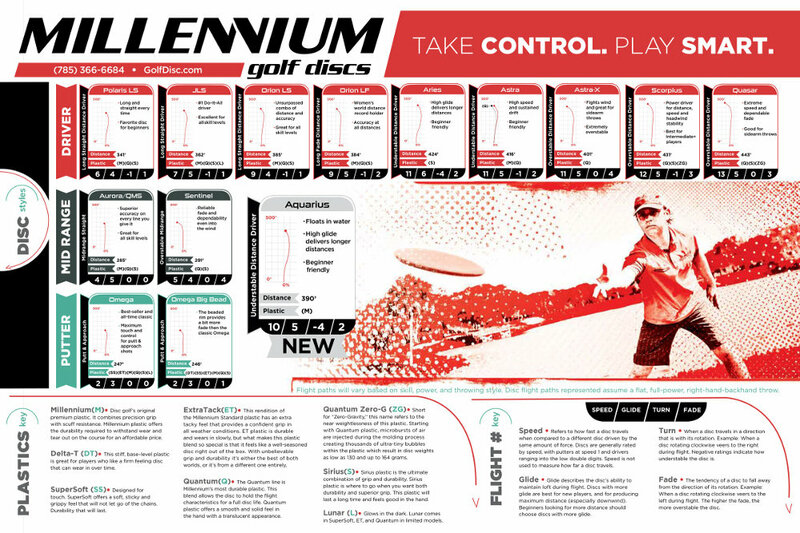 Millennium revolutionized disc golf in the mid 1990’s by releasing the sport’s first line of premium plastic discs. 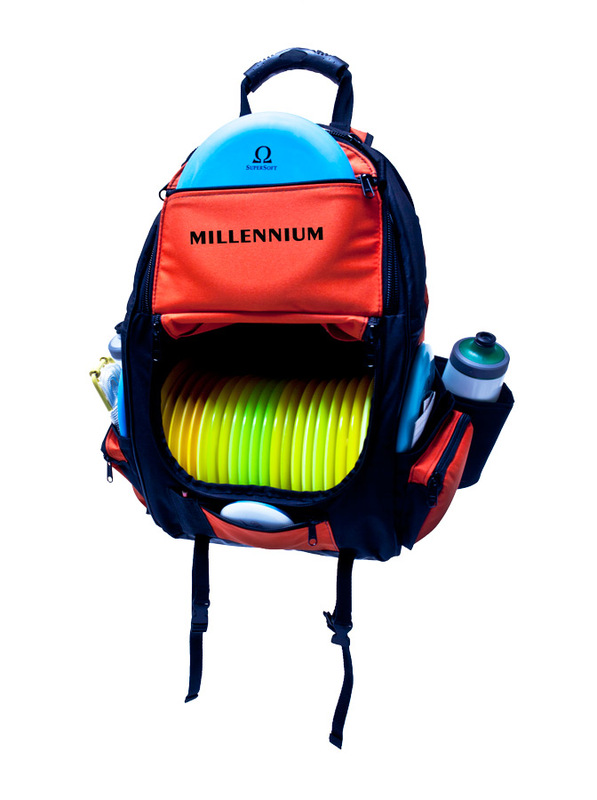 Starting with the Omega SuperSoft, Millennium showed the disc golf world what happens when you combine industry-leading design with high tech materials. 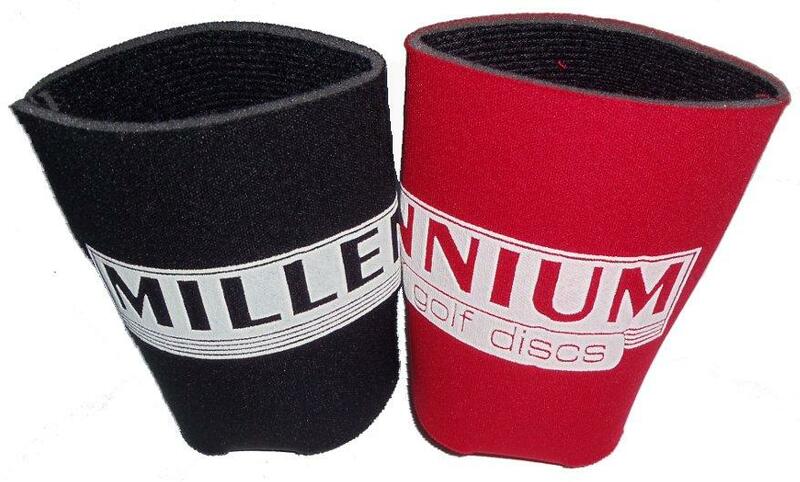 Millennium set the sport in a new direction, and soon every other brand began developing new materials. Millennium or Standard plastic - the original premium plastic, precision grip, scuff-resistance, durability, affordable price. SuperSoft - soft, sticky and grippy feel that will not let go of the chains. Designed for touch and lasting durability. Delta-T or DT - a super-firm baseline plastic with a combination of grip, rigidity, and affordability. ET - an extra tacky form of Millennium Standard plastic with unbelievable grip and durability that makes it either the best of both worlds or Extra Terrestrial, out of this world! Lunar - just what you need for night disc golf - it Glows in the Dark!!! Color Glow - bright daytime shades and glows at night. Quantum - the most durable plastic, smooth and solid feel, translucent appearance, long life of reliable performance. Quantum Zero G (short for Zero-Gravity) - refers to weightlessness of discs, 130-164 gm, models maintain original flight characteristics. Weights 130-139 grams float in water. Sirius - ultimate combination of superior grip and die-hard durability. Recon and Recon Flat Top plastics - premium plastic blends for Hyzer Bomb's discs. Comparable to Millennium Quantum plastic, most durable, translucent, smooth, solid feeling with a long life of reliable performance. The Recon Flat Top has a flatter top. Frontline - premium plastic blends used for Hyzer Bomb's discs. Comparable to Sirius plastic featuring the highest degree of grip and durability combined. Frontline-X - Frontline plastic with added flexibility and grip. Select Millennium discs are available for custom hot stamping or M-Color printing at reasonable rates. Contact us for additional information! We offer many ways to narrow your search to find the best discs to fit your needs. Research all you can and then let us know if you need more help.